Brooklyn Bridge Park — Moey Inc. The Discovery Center is the latest development by the Brooklyn Bridge Park Conservacy designed to provide a center for education on the parks rich natural and human history. 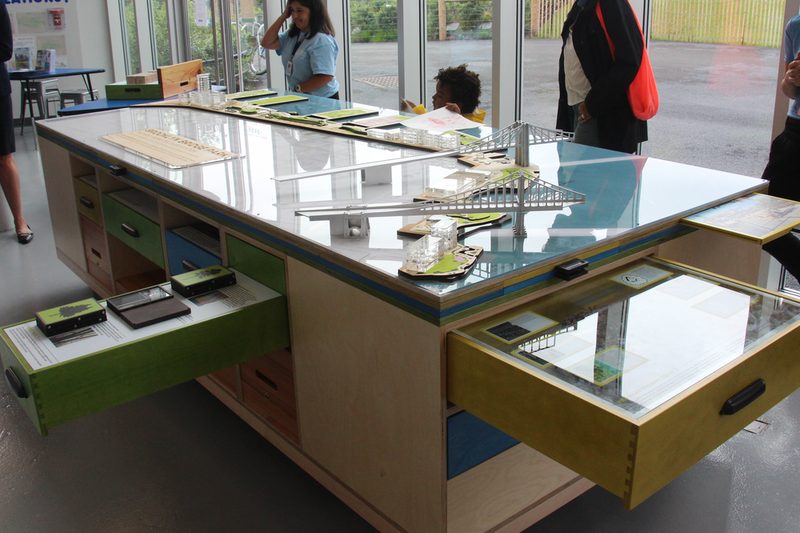 Moey Inc. was responsible for the design and fabrication of the 9’ Discovery Station scale model of Brooklyn Bridge Park, an interactive discovery station that provides an in-depth look at the park’s ecology, history and sustainable design. Child-friendly modules showcase the birds, fish, insects, plant life and geology of Brooklyn Bridge Park. Interactive exhibits and games introduce visitors to the park’s salt marshes and oyster habitat, as well as provide hands-on opportunities to explore the physics of suspension bridges and water pressure. The Discovery Station is an exciting feature for visitors to explore at their own pace and is used by park staff to enrich its school-based classroom programming.